A 3rd Party Plugin is one created by a developer, and which does not form part of the core Joomla! CMS. The process is the same as for installing 3rd Party Components and Modules. 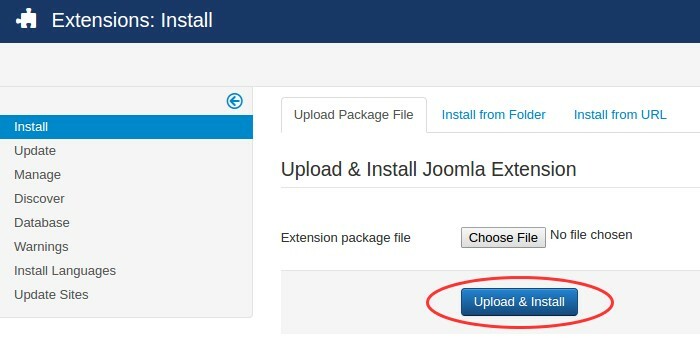 Browse for the Plugin ZIP file on your device and select Upload & Install. Take the following steps to protect your website when installing and uninstalling plugins. Back up your website before installing a plugin. Only download plugins from trusted sites. Test a plugin on a development site before installing on your live site. Next test a plugin on your live site (you may wish to check logs for runtime errors and warnings). Remove any junk files from the tmp directory following installation of a plugin. Periodically check for new releases and update installed plugins. Check with the third party developer that there are no restrictions relating to use of their plugin. 1 All folders, files and database tables left behind following uninstallation of a plugin pose a potential security risk.